Some projects just seem to take longer than others; and by the time they're done, their reason for existing has long since come and gone. This is what happened to this amplifier - a project that grew out of a need for some cheap power which eventually turned into a project to get rid of unused parts. But I'm getting a little ahead of myself. 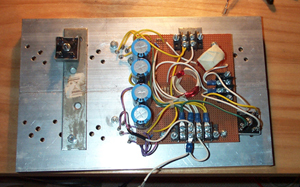 Back in the mid 90's when I first started to assemble my NHT1259-based subwoofers, I reasoned that if I could build a pair of cheap but reasonably powerful amplifiers, not only would I save a $ or two, but I'd also have the satisfaction of building it. 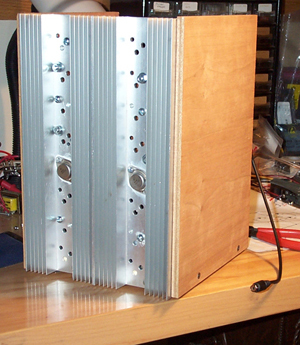 A few other DIYers had successfully built subwoofer amps using dual LM12 op-amps in a bridged configuration. I obtained three free samples from National Semiconductor (free is always good for the DIYer !) and decided to start construction. Some plans just don't seem to work out no matter how hard one tries. In this case, I had trouble getting all the parts I needed, especially a large enough heatsink and transformer. Oh, did I say I wanted them cheap ? Ideally, I wanted a transformer that would deliver about 20 to 22V (40VAC CT) with a decent amount of current (8A min). This would yield a DC voltage near the maximum normal operating range of the LM12. 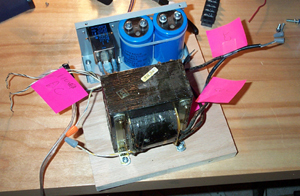 A standard 48VAC CT transformer would be to large, and some DIYers had run into device failures when pushing the standard LM12 (there are some higher voltage parts available). Getting a transformer of suitable size is normally not a big deal, but getting it cheap and not having a timetable for the project meant that I never found what I wanted. I couldn't find any in the surplus outlets and I dismissed the thought of unwinding a large transformer. Over time, my NHT1259 subwoofers were done and put into service. I no longer needed this amp and so the plans were shelved. In the late 90's Adire Audio released their Shiva subwoofer driver and offered the DIY Speaker List an introductory special. I decided that a dedicated subwoofer for a home theater LFE channel would be something neat to build and so the LM12 amp had a new purpose in life. As luck would have it, my overall home theater project never came to be and so I now have both the Shiva and the LM12 project sitting on ice. On the parts front, I stumbled across some large heatsinks with predrilled TO-3 holes in a surplus outlet in Manchester NH. My project suddenly was alive... well sort of. The final piece of the puzzle came from Surplus Sales of Nebraska. They had a 38VAC CT transformer rated at 10 A for $35. Now that I had all my parts, I started assembly. Things immediately ground to a halt when I prototyped a single op-amp circuit. The gain was set to just 3 and the resulting noise was pretty bad. Dissapointed, I put off the project rather than taking the time to debug it; what's the rush since it's been so long already ? I picked up the project and this time set the gain to 20 (a more reasonable value for an amp). I cleanup the connections and things sounded pretty good. Before continuing, I decided to envision the entire thing - what would the completed amp look like ? Can I use it as a unit mounted into the rear of a subwoofer (like a "plate" amplifier) ? What about a preamp circuit for level matching ? What about EQ for the sub ? All these design questions once again stalled the project. Meanwhile, the Shiva project lumbered along at a turtle's pace. It too lacked direction and spent most of its time either collecting dust or sitting in a test box that in turn collected dust. Without my desired home theater setup visible in the near future, there was no incentive to work on the subwoofer. The further complicate matters, the original plan of building a passive radiator subwoofer in a small box now seemed less than ideal. The simulation response curves weren't all that I wanted for the box size I had hoped for... it was all going nowhere. Reality finally set in. I had to put these projects aside to make room for other projects; and the best way to do that was to finish them. With some unresolved questions still lurking in the background, the smart thing to do seemed to be to package up both the LM12 and the Shiva project into a semi-finished state in the quickest, most cost effective manner. For the LM12, this meant housing it so that it could be used if necessary but not in anything fancy in case I ever decide to re-house it some day. So here it is, two large heatsinks bolted together, then screwed to a piece of plywood. The enclosure has 4 sides. It is missing a top and most of the back. It is fully wired but has not preamp, crossover or EQ functionality. All that is for the future, whever that is ! The details here are a little sparse because, frankly, there's not much to say ! The design is the basic LM-12 amplifier circuit as published in the LM-12 specifications from National Semiconductor. I used the bridged design, using two LM12s for a single channel (one inverted, one non-inverted). The voltage gain is set to 20. This is the heatsink assembly. The circuit board doesn't hold much - just a few passive parts and electrical connectors. I could have easily bolted a few terminal strips to the back of the heatsinks and performed the same point-to-point wiring but this looks a little cleaner. The are three sets of screw terminals. Towards the bottom is a set of four for the power supply. The (+, -, and two for ground). The two screws near the top is the input signal. Finally, the two near the right edge is the output to the speaker. 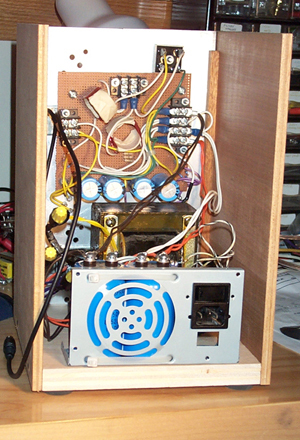 The bridge rectifier on the right is on the output to the speakers. 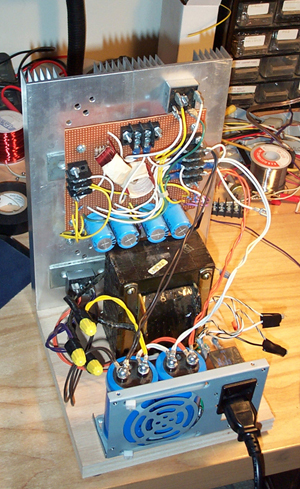 The unconnected bridge rectifier on the left is for the main power supply. The heatsink is electrically isolated from all components (bridges and LM12). This is the power supply assembly. The pink PostIt notes identify the transformer's secondary to be used by the LM12s. There is also another unused secondary winding (orange and grey wire nuts on the left side). The metal plate near the top is part of an old ATX computer power supply. I originally intended to mount various components in the ATX chassis but decided at the last minute to scrap the idea. I ended up using part of it so that I could easily mount an EIC receptable, an accompanying line filter and the main power supply caps. Since this whole box is temporary, it's no big deal. The heatsink assembly is screwed to the plywood base of the power supply assembly. Two screws is all it takes. All wiring is removable. The side panels are just pieces of plywood. Four rubber feet at added to raise the unit. The black cable on the left side is connected to the input screw terminals; the other end has a female RCA connector.